What is with the lack of selection when it comes to circular saws that are blade on left? It is actually very surprising to me that manufacturers do not make their circular saws in both versions. Do they not realize that some people are left handed, or are like me and just prefer to be able to cut with my right hand, and see the cut at the same time. Cordless saws are blade left, and so are worm drive saws. Why should people have to switch between both, and not have a choice? Some manufacturers actually do make blade left saws, but usually the selection is very limited, and so are the features. Out of all the major manufacturers, if you are looking for a 7-1/4" blade left circular saw with an electric brake, you have only one choice, the Porter-Cable 424MAG. 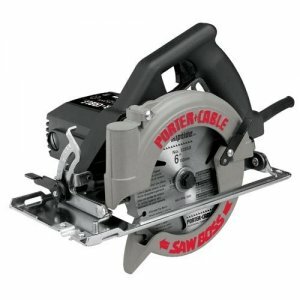 With Porter Cable being placed between Black & Decker and DeWalt, who knows how long this saw, or the quality of the saw will last. Props to Porter-Cable, at least for now. All the other Brands need to get their act togerher.